PHOENIX, AZ – APRIL 25: Steve Nash #13 of the Phoenix Suns during the NBA game against the San Antonio Spurs at US Airways Center on April 25, 2012 in Phoenix, Arizona. The Spurs defeated the Suns 110-106. Ever since my time of watching the game of basketball, I have come to love and understand the connotation and sovereignty of the NBA Draft. The image of a bemused David Stern announcing the annotation and coronation of a new astute and propitious prodigy; a player who an entire city would draw hope from, dream and expect to represent them and stand true to their fads and whims. The scene was no different when Stern stood up and announced that, “With the 15th pick of the 1996 NBA Draft, the Phoenix Suns select Steve Nash from the University of Santa Clara.” As, Nash was busy celebrating with his family and still trying to come to terms with the sudden change in his fortunes, the commentators were busy eulogizing the diminutive player hailing from British Columbia, Canada. They lauded his ability to shoot the ball as well as his play-making abilities but even they didn’t sound much convinced. 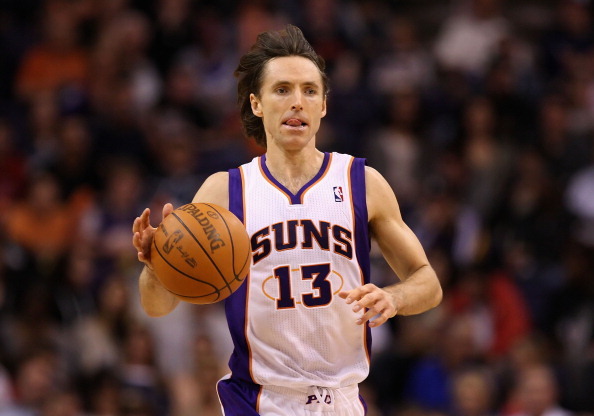 Everybody was shocked when the Suns chose Nash so early into the draft. The doubts were evident, and a certain section of the Suns fan-base jeered and booed their team’s choice, especially when they already had a roster that boasted of the likes of Kevin Johnson, Sam Cassell and Jason Kidd. Incertitude about Nash was primarily born of the fact that he came out from Santa Clara, a non-existent team on the NCAA circuit, and thus many doubted his temperament and ability to make it big in the NBA. Shades similar to what John Stockton had to go through when he was selected as the 16th pick from Gonzana in the year 1984. By, 1996 Stockton’s stocks were on a high, his legacy vindicated, and his talent realized and bedizened by both fans and pundits. Nash came into the league with pretty much the same baggage; a diminutive guard trying to ply his trade among the herculean and gargantuan players in the league. Not so surprisingly, he was referred to as the poor man’s John Stockton. However, Stockton then was already on his way to basketball immortality, and expecting anyone to match up to his ability was a tall order indeed. Nash was least bothered about that as he set about trying to find his feet in the league, carving a niche for himself. The start wasn’t by any means rosy for him. PHOENIX, AZ – FEBRUARY 19: Steve Nash #13 of the Phoenix Suns moves the ball upcourt during the NBA game against the Los Angeles Lakers at US Airways Center on February 19, 2012 in Phoenix, Arizona. The Suns defeated the Lakers 102-90. In his first season with the Suns, Nash struggled to find much playing time averaging a meager 10.5 minutes to go along with 3.3 points and 2.1 assists per game. He still was shooting the ball very well and at 42.3% finished the season with the second best 3-pt percentage ever as a Phoenix Suns rookie. However, the savants and the fans hadn’t still warmed up to him as he remained a liability on the defensive end of the floor and with a PER of 10.8 wasn’t setting the offensive end on fire either. Nash’s playing time significantly increased in his second year with the Suns, as the Suns had traded away Cassell and that allowed him greater responsibility and playing time as the back-up to Kidd. He averaged over 20 minutes per game, and played 72 games for the Suns. His numbers though still not being monumental and titanic, was a significant improvement as he managed to average over 9 ppg to go with 3.4 apg. His PER though still not matching up to his potential was hovering near the league average at 15.6. Nash was frustrated with his start in the NBA, frustrated with his lack of playing time and embittered with the fact that the fans still hadn’t warmed up to him. Nash in his time at Santa Clara had befriended Donnie Nelson, son of the Dallas Mavericks coach Don Nelson. On Donnie’s referral Don Nelson pitched in for a trade that brought the talents of Nash to Dallas, while giving away Martin Muursepp, Bubba Wells and the draft rights to Pat Garrity and a future first-round pick who would turn out to be Shawn Marion. Nash’s arrival at Dallas was matched with the serendipitous arrival of another much hyped talent from Germany, Dirk Nowitzki. The Mavericks envisaged fueling their struggling franchise, by adding the two foreigners to the sublime talents of their star player, Michael Finley. The league was interested, but not yet convinced about the legitimacy of such a blue-print. Nash and Nowitzki were welcomed with open arms by the Mavericks, but both players were stepping onto alien roles, and expecting result straight away was too much to ask for. 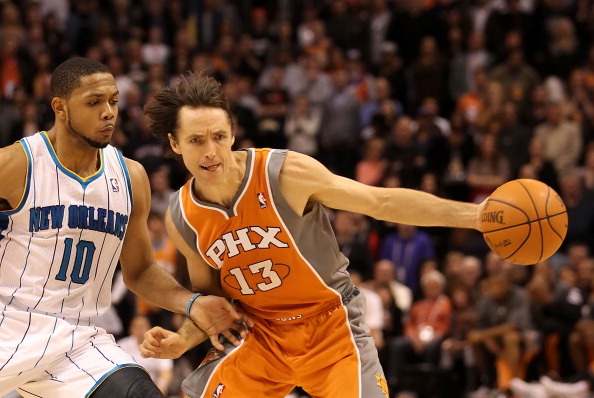 PHOENIX, AZ – DECEMBER 26: Steve Nash #13 of the Phoenix Suns handles the ball during the season openning NBA game against the New Orleans Hornets at US Airways Center on December 26, 2011 in Phoenix, Arizona. The Hornets defeated the Suns 85-84. Not surprisingly the duo struggled and the fickle and not so charitable fans had their daggers out. Nash was particularly pedestrian averaging 31.7 mpg, but managing to get only 7.9 ppg to go with 5.5 apg. At a PER of less than 11, and averaging a career low in terms of shooting percentages, he was certainly struggling. The Mavericks fans had developed a violable loathing against him, a feeling they unabashedly expressed by booing him every time he touched the ball. Nash was playing at home, and was booed by his own fans. Clearly, Nash’s journey in the league could not have gone any worse. It was then that Nash found solace and hope in Nowitzki. The kid from Germany whose struggles were no less than Nash’s, stuttering and falling in his attempts to match up with the physicality and demands of the league. A 7-footer who liked to shoot was an idea alien to the league, and the fans wanted Nowitzki to try and embody a certain Hakeem Olajuwon. He wasn’t a player like Olajuwon and didn’t have much time and acclimatization on his hands; a story much like Nash’s. Deemed unfit for the league, too soft for most fans and savants. Now, the movie was filmed long after the duo was going through their struggles, but the lesson was certainly not much different. They started to help each other out, put in the extra hours in the gym and keep each other motivated and focused. Their efforts bore fruit as the duo scripted an improbable success story with the Mavericks. Nash had outgrown the 22-year old golden haired kid with dreamy eyes in him. The Nash of 2000-01 was pretty much like a war-hero; his hair was jet black now, his eyes of steel showcasing his belligerent desire to prove his worth. A clear reminiscent of a certain Severus Snape, a wizard with the ball, an unselfish hero at a far greater level; and in many terms with his jet black hair and eyes, a pretty clear connection. 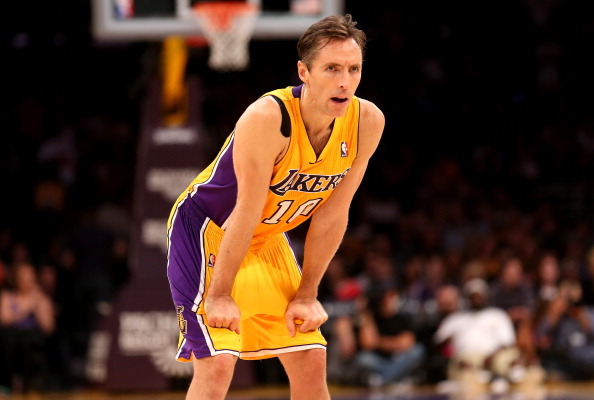 LOS ANGELES, CA – OCTOBER 21: Steve Nash #10 of the Los Angeles Lakers waits on the court in the game with the Sacramento Kings at Staples Center on October 21, 2012 in Los Angeles, California. The Kings won 99-92. Nash’s numbers in the 2000-01 season and the season onwards showed a rapid improvement. In his next 4 season with the Mavericks he averaged over 16 points and 7.6 assists per game. Riding high on the superlative efforts of their point guard, the Mavericks launched many legitimate play-off runs, but never made it to the Finals. While the trophy cabinet might not have seen many additions, he was certainly setting the NBA stage on fire with his play-making abilities. His ability to throw the most difficult of passes with intrepid ease and comfort, to understand and deploy the toughest of angles, and to have the vision and court-awareness to find an open teammate characterized the league’s newest star point-guard. A throwback to Magic Johnson possibly, he played with a style and panache that the league hadn’t seen from a point guard since a long long time. The seemingly impossible passes, and his leadership and ability as a floor general saw him get into 2 All-star games as well as dominate many a highlight reels. However, for all the aesthetics, the swagger, the brio and the flamboyance to go with the underdog coming through stories, the Mavericks still didn’t have anything to show for. A second round play-off visit was far less than what the franchise desired from Nash and company. And when Mark Cuban started at the helm, he put an end to the honeymoon. He saw the Mavericks future with Nowitzki as the franchise superstar, and in that pantheon there was no place for Nash. Nash and Nowitzki had always envisioned winning championships together, playing with and for each other. But, Cuban and the Mavericks management weren’t on a similar page and Nash had to look for a new home to ply his trade. 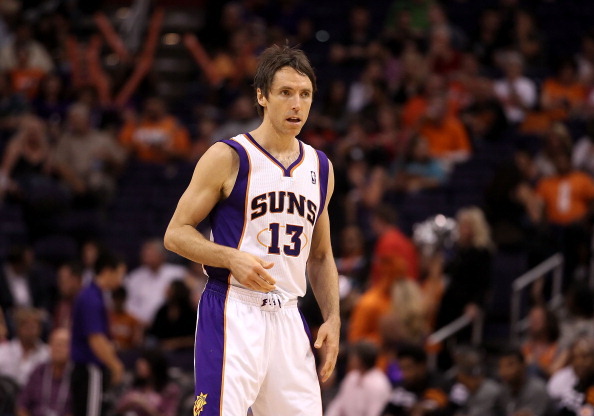 As destiny would have it, Nash signed for the Phoenix Suns. Life had come a full circle for him, as he stood poised on scripting the next chapter of his wondrous basketball journey. Vindication maybe for all the jeers and boos that he was subjected to in his initial days, Nash on his return changed the face of the franchise. United with an offensive genius in Mike D’Antoni, and with a supporting cast of Quentin Richardson, Joe Johnson, Shawn Marion and Amare Stoudemire, Nash’s insuperable play-making ability had met its most suitable benefiters. He prospered and posted incredible numbers, averaging 15.5 points and 11.5 assists per game, with a PER of 23.4. He led the league in assists, a feat that he would repeat 5 times in his forthcoming years at phoenix. The run-and-gun up-tempo basketball style, suited Nash’s strengths and he threw-up some of the most amazing passes that the NBA had ever witnessed. His ability to play the pick and roll was much perpetuated and in a player like Stoudemire, Nash had the perfect foil as he set about re-writing the rules and methods of the set made much popular by Stockton and Malone. His ability to pick the perfect pass, between a maze of defenders and to find the cutting player or the spot-up shooter was the major reason driving the resurgent Suns, as they set the NBA on fire with their lucid offensive repertoire. Showtime had a new home, and the city had a new Prince. Behind the back, between the legs no-look dimes, impossible fade-aways, Clutch shots, Leadership and unselfishness!! . He did it all as he drove the Suns on an exhilarating ride. Nash had taken the Suns from a 29-53 record to a team that won 62 games and finished as the best offensive team in the league. Much deservedly, he was crowned as the season MVP, an award richly deserved as the season saw the emergence of a great player, a legend. He was the 3rd point guard ever to win the title and when he repeated the feat in the next year, he joined the illustrious ranks of the likes of magic Johnson as players who won back-to-back MVP titles. He also led the Suns to the Western Conference Finals in the year 2005-06 where they faltered against the eventual NBA Champions in the San Antonio Spurs. 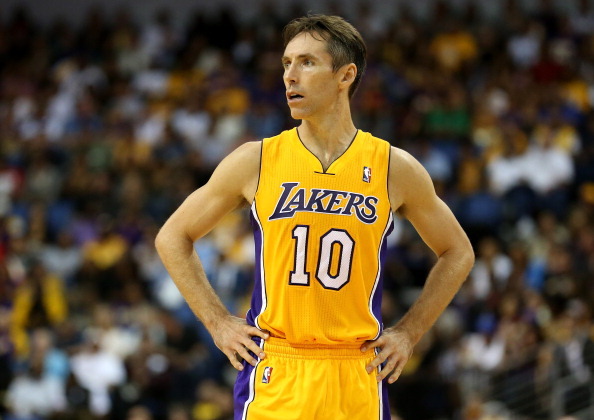 ONTARIO, CA – OCTOBER 10: Steve Nash #10 of the Los Angeles Lakers stands on the court in the game against the Portland Trail Blazers at Citizens Business Bank Arena on October 10, 2012 in Ontario, California. Nash was filling up the stat-sheet but still longed for the spangle to coronate his NBA career. The dream end maybe, but despite making two trips to the Conference Finals in 2005 and 2008, he failed to get his team through to the NBA Finals. With the supporting cast of his team falling apart, and with many new faces coming into the Suns franchise, he never had a steady team to build with. When Mike D’Antoni left, many believed the Suns and Nash were done for and many questioned their legitimacy. Nash did his best, using his indomitable play-making abilities to make the likes of Frye, Dudley and Jason Richardson seem much better players than their abilities allowed them. He shone through as an ideal floor general, who allowed his teammates to express themselves freely and play the way they are comfortable. He shared the ball and created opportunities that he knew they could convert. He kept their hope and confidence high, invaluable lessons from his early struggles in the league. Nash found his share of self-respect, as he grew out of the young and adventurous kid from Canada, into a living legend in the NBA. He is now the 4th highest in terms of assists, and with a good three years left on his contract, one can expect him to climb many such rungs. A philanthropist, and a true family guy, Nash has certainly fulfilled all the golden rules of being a star. Be Legendary, Appear Complex, Act Easy, Radiate Presence, Travel Light and Prove Real.